Cope with chaos, change and crisis. Stay fluid and flexible in trying and changing times. Use laughter to loosen up. Explore the science of laughter (how laughter strengthens our immune system and reduces stress). Explore the art of humor (strategies to enhance optimism to move from “OH NO!” to “AH HA!”). Discover when to let go and when to take action. Use humor to create a happier thinking process and proven techniques for changing unproductive behaviors that can sabotage your own happiness and success. 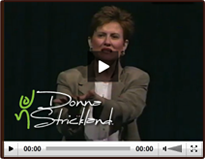 Available in a keynote, half-day or full-day seminar format, Donna’s speaking presentation is designed to help those who are serious, dignified and professional to lighten up. This playful, skill-building session creates an atmosphere of fun in order to solve our human problems. You will explore techniques for getting through life, love and loss, trials and tribulations, and all that not-so-funny stuff. You will also explore “de-light” and “de-dark”. Coping with change and transition. Healing Interval Breaks: Ideas and Techniques, Humor Mantras, Finding your sense of perspective. Hands-on activities that promote laughter, mirth and fun. Overcoming Fear of Foolishness, Failure and Embarrassment. Its relationship to risk-taking, shame, stopping ourselves short from being in the moment. Hire Donna Strickland for a keynote or seminar by contacting us directly at (303) 808-4880.